Welcome to the March 2018 issue of Black Grooves, sponsored by the Indiana University Archives of African American Music and Culture. 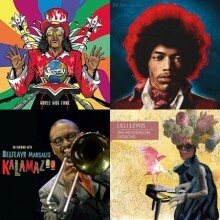 In honor of our upcoming program Funkology: A Conversation with Bootsy Collins and Dr. Scot Brown, we’re featuring recent funk releases pertaining to our honored guest in addition to compilations from notable legends and the latest in contemporary jazz, spoken word, rock, soul and world music. Leading our funk selections is the latest release from Bootsy Collins himself, World Wide Funk. Meshell Ndegeocello’s Ventriloquism pays homage to many artists, including George Clinton and Bootsy Collins, while Los Angeles-based funk group Orgōne provides covers of classic P-funk songs such as “The Breakdown” and “Cosmic Slop” on Undercover Mixtape. The three disc Life on Planet Groove Revisited is a 25th anniversary expanded reissue of Maceo Parker’s funk classic, and the U.K.’s affinity for funk is represented through Crowd Company’s Stone & Sky. New compilations from iconic artists include Jimi Hendrix’s Both Sides of the Sky, the Rolling Stones’ On Air featuring early blues covers recorded by the BBC, Nina Simone’s The Colpix Singles, and the Dionne Warwick collection Odds & Ends: Scepter Records Rarities. Featured jazz group Robert Glasper Experiment gives a front row seat through their DVD Live, and Kalamazoo by Delfeayo Marsalis also showcases live performances. Wrapping up this issue is Los Rumberos De La Bahia’s Afro-Cuban stylings on Mabagwe, the spoken word poet Jerry Quickley’s collaboration with Busdriver on (american) Fool, New Orleans’ artist Lilli Lewis’s The Henderson Sessions, a reissue of a rare soundtrack from the musical Two Sisters From Bagdad by Detroit’s LaVice & Company, and our compilation of February Releases of Note.